I was going to try to say which were my favourite pieces, but listening to it again I am finding it difficult to decide between these 18 pieces. He certainly covers a range of emotions and sometimes when you are distracted and impressed by the speed of his playing, the music suddenly grabs at your heart to remind you that what he is playing is a communication through music and the technique is secondary. If you have aspirations to play pieces by Sabicas, Alain Faucher has published six transcriptions of the pieces from the Sabicas – Rey del Flamenco LP in a book by the same title: Sabicas – Rey del Flamenco (Affedis). I know it is a bit lazy of me to be buying a CD of an LP that I already have on the shelf; I like playing my records but it’s having to get up to rescue the needle when it gets to the end of one side (my player doesn’t automatically go home at the end of one side) that puts me off. But there are other reasons, in my case, to buy the CD! I bought ¡Olé! La Guitarra de Sabicas as an LP in my youth. 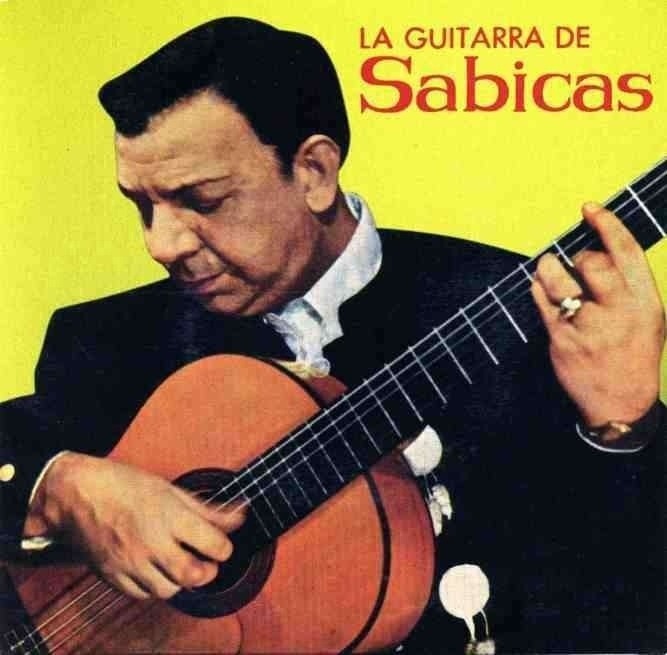 At that time Sabicas (1912–1990) was still alive. I bought it in Australia for $17.99 (interestingly my CD of the two LPs cost about the same, decades later!). It was issued on the Polydor label and imported from Japan, so sadly all the LP notes on the back are in Japanese. On my new CD I have liner notes written by the very knowledgeable José Manuel Gamboa. Of course I am very grateful to have the two LPs squeezed onto one CD; but there is one track missing from the ¡Olé! La Guitarra de Sabicas LP album, the Colombiana De Los Rizos de tu Pelo. While at El Mundo Flamenco I met a flamenco enthusiast who had had the good fortune to meet and have had some lessons with Luis Maravilla in Madrid many years ago, and who had met other flamenco guitarists from that era there. I also spoke with Martin who had studied with Philip John Lee. I was at El Mundo Flamenco for long enough to chat comfortably with everyone but not so long that I bought mountains of books, music and recordings – but the temptation was great!